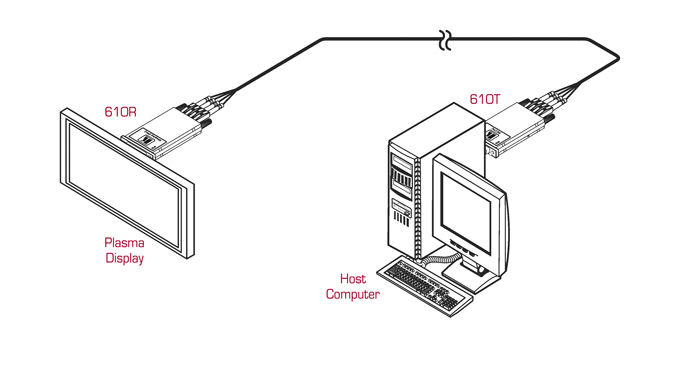 The 610T and 610R are a detachable optical transmitter and receiver for sending DVI signals with resolutions of up to 1920x1200 at 60Hz over LC optical cable. The 610T attaches to the transmitter side of a fiber optical cable and the 610R connects to the receiver end and both are sold as a set. Max. Data Rate - 4.95Gbps (1.65Gbps per graphic channel). System Range - Up to 400m (1312ft). Cable - Multimode fiber optic cable with 4 simplex or 2 duplex LC fiber connectors. Power - External power adapter (supplied) or 5V DC from source. Standards Compliance - Certified for medical applications according to IEC 60601-1-2 (Electromagnetic Compatibility). EDID Capture - Copies and stores the EDID from a display device (610T).